WOMEN'S ANNE KLEIN IFLEX AKHARVA BLACK DRESS SHOES SIZE 7M. Condition is Pre-owned. Shipped with USPS Priority Mail. YOU ARE LOOKING AT A SLIGHTLY WORN PAIR OF ANNE KLEIN I FLEX DRESS SHOES..SHINY BLACK SY...7.5M(NARROW)....IAM NOT SEEING ANY SCUFFS OR MARKS ON THESE SHOES...STILL LIKE NEW .. PLEASE SEE ALL PICTURES AND ASK ANY QUESTIONS BEFORE BUYING... LISTING MORE SO FOLLOW ME TO CHECK THEM ALL OUT... SHIPPING DEPENDS ON YOUR LOCATION BUT I WILL FIND THE BEST PRICE FOR YOU THANKS FOR LOOKING! Anne Klein Size 6.5M Women's Peep Toe Sandals Flats Pink Blush Snakeskin Bow . Shipped with USPS Priority Mail. This is NOT personal, as it applies to everyone. Great used condition. Unless otherwise stated, these shoes are preowned and do not have original box. AK Anne Klein round toe black patent pumps. Ladies size 10. Excellent pre-owned condition. Block heel. 3” heel. No scuffs or marks. Non-smoking home. Length (Heel to Toe): 10.75". Bottom soles are slightly dirty from being tried on. Insoles are clean. Heels and toes are clean. Shoes are like new and in excellent condition. Heel: 2.25". Insoles: 10.25". New with out box Anne Klein sling back sandals. These are gold and bronze color. So sad my feet are not a 8.5 anymore. Smoke free, pet free home. USA shipping only no APO no paperwork will be completed to ship, no returns. 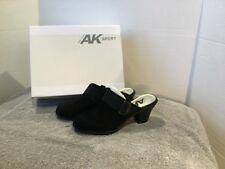 Anne Klein Sport Women Shoes Black Wedge Slip On Shoes (Size 10 M) New! ‘Jarry’ style. Open toe; sling back. Heel height approx 3 3/4” (from foot heel back to tip of heel). Size 7 ( on shoes 7.5, but too small, tight). Anne Klein 2 Akedyta Open Toe Tan and Metallic Slingback Heels Sandals Women's Size: 6 Medium Heel Height: About 3.5” Material: all man made materials Sturdy pair of heels to dress up any outfit. Pre-owned in good condition and shape with very minor wear. Some small markings on heel and toe area. See photos as they are part of description. These run a bit big. HEEL HEIGHT: 1.75". Need it fast?. AK Anne Klein iFlex Technology allows for a flexible fit that can bend up to 90 degrees. Get wear-with-all versatility and be happy with theAnne Klein Happy. Faux patent leather upper. I will do my best to provide the best service and the best price. Anne Klein Akkea Size 6.5M Women's Peep Toe Sandals Flats Gray Snakeskin Bow . Shipped with USPS Priority Mail. Select wrong size or doesn't fit as the reason. - Select the item. Every item we list is inspected by hand individually; all photographs are of the exact item you will receive.